Gray Horsfield, you may or may not know this guy but he was a superb animator over at Valve responsible for many memorable scenes in their video games such the Left 4 Dead evacuation scenes and Portal 2’s opening where Chell’s room gets taken for a ride by Wheatley. But among other things in the footage are possible sightings of Half-life 3 / Half-Life 2: Episode 3 because some of that footage has not been in any Valve game and it shows a Half-Life 2 style HUD to us as well as Gordon Freeman holding a Gravity Gun, what else could it be? Someday YOU will be there. Half-Life 3 / Half-Life 2 Episode 3 is a modern day Duke Nukem forever, it is a game which everyone is begging to see / heavily speculating but Valve continues to play with our hearts and minds and continues to not drop US any hints of a possible reveal of the game anytime soon, last year Gabe Newell announced that he will be unveiling something at this years E3 and he even hinted at something with a “3” in it but this could be a variety of options such as Team Fortress 3, Left 4 Dead 3, Portal 3 or even a new Counter-Strike game which will be free to play. The chances of Half-Life 3 being in this years E3 are pretty low considering all the mysteries Valve has left us with and the infamous saying that Valve can’t count to 3 might just be proven wrong at this years E3. The following showreel belongs to a former Valve employee named Gray Horsefield, he shows his various works in action in Valve games but whats really interesting is the swarm like creatures which have never come in a Half-Life game before: I suggest you watch it ASAP and spread it around faster before it gets removed again. Am I the only one who feels like Valve is just toying with our emotions for all these years? After the extremely tearful ending of Half-Life 2: Episode 2 I have been waiting ALL those days just for any news on Half-Life 3 / Episode 3 but it seems Valve will keep taunting gamers and continue to release additional Hats for Team Fortress 2 instead. UPDATED WITH SOURCE AND VIDEOS. IGN Hinting at Possible News on a New Half-Life Game? 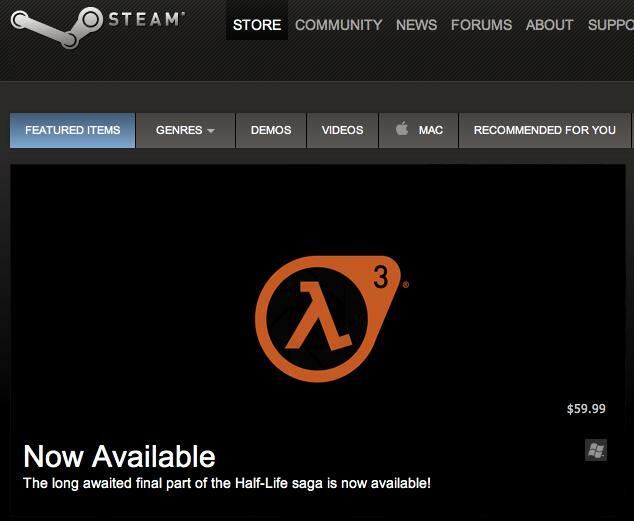 Half-Life 3 Logo Makes A Surprise Appearance Possible Fake?